I have been promising a Great Big Plants Story for months now, and I thought that people from the Aliso Beach and South Laguna communities would enjoy the article. I am glad, however, that I waited to write this story because the success of the product since the time period that I was supposed to write the article in has shown 15 times better results. Let me start by going back in time and talking about how a connection has turned into the promotion of an amazing product with real results in my own backyard. My fraternity brother’s family owns Left Coast Brewco in San Clemente, California. He had been nudging me for at least a year to come check out the tasting room. Not sure why I didn’t take the bait of finely crafted beers until nearly 2 years of existence as a business, but I finally got there. In addition to the quality of their micro brews, I was struck by the type of people that were in the tasting room regularly and felt like it could be really good for business. The clientele at Left Coast is really cool. One of the people I met early in my time at Left Coast was this funny, young, twenty something who had a penchant for thrift store work shirts. Everyone of them came with a different name sewn on the shirt and a different company name. I found that hysterical and lo and behold Spenser was someone I talked to a lot while at Left Coast and a friend. One day we ended up in a conversation about his family business Great Big Plants. I told him that 2014 was very productive for tomatoes in the backyard and that 2015 had been for the most part a disappointment. He suggested that I try his organic Great Big Plants solution which puts beneficial nutrients and microbes back in the soil that are beneficial to growth and productivity. He was even willing to bring me a complimentary sample. It seemed like a lost cause but I was down to test it out. The plants looked like they had completely given up and the life had been sucked out of them. Two of the three tomato plants after feeding them the solution for a couple of weeks roared back with a deepening healthy, green color and new foliage. There wasn’t a single tomato initially, and the flowers that started to spring to life seemed to be die and fall to the ground. That was discouraging, and the bees that were so prevalent in the spring were nowhere to be found. When this feeding process first started it was late summer early fall. It was not a forgone conclusion that this would work but in addition to the color, the vibrant smell of the plant became more pronounced and a tomato magically appeared. I began to notice that the local humming birds that chase each other around the yard for priority on the feeder hanging from the back patio, were now interested in and feeding on the nectar from the tomato plant flowers. 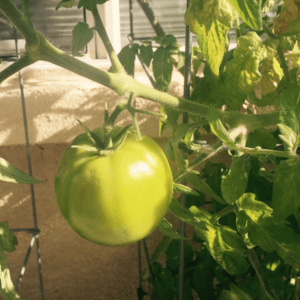 For awhile, the lone tomato grew larger and then one day, it seemed like there were 5 or 6 more. 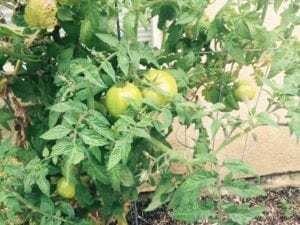 The plants aren’t out of the woods though as winter temperatures and predicted El Nino rains threaten the viability of keeping the tomato plants. 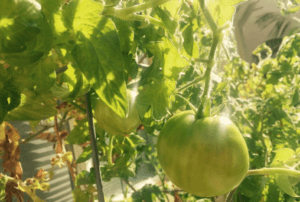 There are now 15 tomatoes on the plant which to me is absolutely remarkable. They are all green and not quite at the ripening stage. 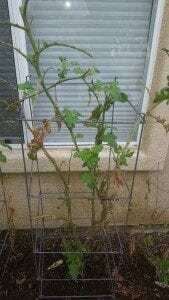 I am hoping that they continue to develop into a salad friendly fruit, or vegetable depending on who you talk to, but the branches are starting to split under the weight of the tomatoes. This may force the decision to pick the larger tomatoes to see if placement next to a ripening banana starts a chain reaction that leaves them all red. Understand that I had no expectation for results like this. I was convinced that there was something to this solution when I saw the new, green growth and a single tomato formed. The odds were long so getting to 15 tomatoes in my mind is nothing short of amazing. We are approaching 3-5 days of rain, and I will be interested to see how well the plants hold up. Plan B is to remover the big ones to see if they can be influenced to ripen by bananas. Why is this important to Aliso Beach or South Laguna? One of my initial thoughts was that the greens over on the 9 hole course at The Ranch At Laguna Beach were treated with pesticides and fertilizers that get into Aliso Creek. As you may know, phosphorus in fertilizers contribute to algae blooms that upon their death leave a toxin called domoic acid that poisons shellfish beds, lobsters, crabs, fish and larger sea creatures that feed on them. Couldn’t the Ranch at Laguna Beach make a change that keeps the greens healthy and pristine without the use of harmful pesticides and fertilizers? Wouldn’t such a move keep in line with the purpose of maintaining the Marine Reserve at Aliso Beach which is downstream from the golf course? Keep in mind this is just me thinking about the potential uses for Great Big Plants. The company is already responsible for flipping a country club in South Orange County into their product and doing away with harmful fertilizers and pesticides. It makes me think that it is possible at a place like the golf course at the Ranch at Laguna Beach. The product works. I can and do enthusiastically speak on behalf of the Great Big Plants solution. I thought that in order to talk about the product the way I should that I would need to perfectly understand the science of it. With the plants coming back to life off season and producing tomatoes, all the evidence needed is the tomatoes growing on a couple of plants that were basically dead when the solution was first applied. After a 30 day period not feeding the tomato plants, some of the foliage died and they did not look as healthy. The tomatoes kept growing despite the leaves turning brown and the Great Big Plants feedings are back under way. We will see what happens, but either way, there is more than enough to convince me that this product does what it says it will do. I will leave the science of that up to Spenser. My enthusiasm for and belief in the product was enough to connect Spenser with a large player in the landscape and organic gardening business in South Orange County. The rest is up to Spenser! It feels good to get this article out there and honor my friend whose family has a product I believe everyone can benefit from. 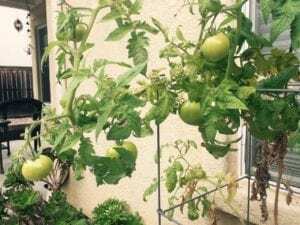 Linking the organic gardening and landscape business to Great Big Plants feels like a very natural fit with the opportunity to partner on business that makes a real difference in South Laguna and neighboring communities. The potential for this company to redirect businesses and residences to organic and sustainable gardening is a massive opportunity. In today’s climate, I feel like people are ready to circle back to growing their own vegetables organically and contributing to the environment by discontinuing the toxic pesticides and fertilizers that deliver foods laden with poisons and soils that produce runoff that gets into our salt and fresh water. Using Great Big Plants is a win for everyone!